A few months ago, I discovered The Moth podcasts. The Moth is a non-profit, and essentially an open-mic for storytelling. A.J. Jacobs, one of The Moth storytellers, recently told a story about outsourcing, which is where I first heard about Virtual Assistants. While you’re reading this, click play below. Take some time to watch the podcast. The podcast, though, is only a summary of the article A.J. wrote for Esquire. So after hearing this podcast, I was a little conflicted. Should I really hire a virtual assistant? There were some practical questions. For example, if I hired someone, what should they do? Should I hire someone to handle work I should be doing? Afterall, if I can’t get something done myself, is it worth doing? I put my conflicts, worries, and anxieties aside. I was inspired. At first, I really wanted to hire Honey from India, the assistant that A.J. Jacobs worked with. What firm did she work for? With that question, I was off. I started my search. There were many more options than I could ever hope for. I looked around for a while, and signed up for a few but finally settled on BPOVIA. Unlike AJ’s outsourcing firm, BPOVIA is based in China, not India. What’s truly amazing is that you not only get 1 person, but a whole team of people. 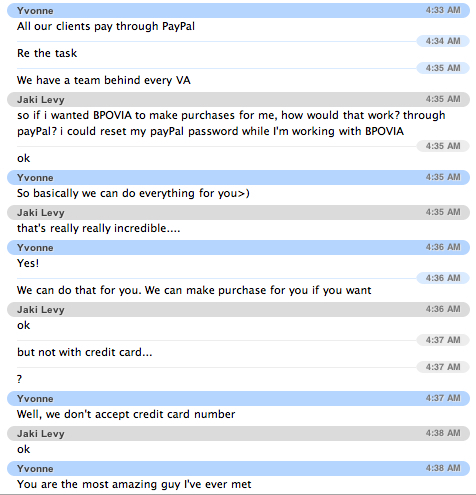 After signing up for 10 hours of help and assistance, I received a confirmation email from Yvonne within 24 hours. In addition to doing repetitive tasks like data entry, they also provide many other services, including Graphic Design, Accounting, Invoicing, and even Tax Preparation! BPOVIA uses Basecamp to manage tasks, to-do’s and store files. I’ve been using Basecamp to run things on my end for over 1 year, so I was very pleased to see they use the same online software. Above all, they are incredible kind, and apparently can do everything. I mean EVERYTHING! For proof, take a look at my chat transcript below. Check back for another update at the end of my 10 hours. And of course, you can always google “Virtual Assistants” if you’re really curious. Thanks for sharing that audio. AJ Jacobs is a cool dude. If you’re in NYC, AJ Jacobs is actually speaking at Social Media Week. Take a look at this post from the Examiner on Social Media Events this week.